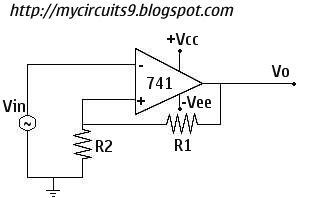 Schmitt Trigger is a Comparator and it is known as Squaring circuit because it converts an irregular shaped waveform to a square wave. The output voltage changes its state every time when input voltage crosses the threshold level. The input voltage at which the output switches from +Vsat to -Vsat is called the Upper Triggering Point (UTP). The input voltage at which output switches from -Vsat to +Vsat is called Lower Triggering Point (LTP). The Triggering or Threshold voltages are obtained by the voltage divider R1-R2. Suppose the output voltage is +Vsat. Now the Voltage across R2 is Vutp. Which is equal to +VsatR2/(R1+R2). When the input Voltage exceeds the voltage across resistor R2, output goes to -Vsat. Now the voltage across R2 is Vltp. Which is equal to -VsatR2/(R1+R2). When the input voltage goes lower than this voltage, output goes to +Vsat.